Nicanor Custodio Hidalgo, who came to Spain in 1984 as a Spanish-language scholar of the Instituto de Cooperacion Iberoamericana (ICI), held a posthumous exhibit of his paintings last December 18 at the Parroquia Nuestra Señora del Espino in Madrid, Spain. “Nick,” as he is more popularly known, passed away last December 6 after battling with colon cancer. Aside from being a well-loved teacher of both Spanish and English, Mr. Hidalgo was a very active member of the Filipino community in Madrid. As one of the earliest Filipinos to migrate to Spain, he helped organize religious and cultural activities that drew Filipinos closer to one another. He was also a tenor who (along with his younger brother Willy, and fellow former ICI scholar Mr. Florencio Aliganga) formed part of a trio that entertained Filipino and Spanish audiences with their repertoire of Filipino, Spanish and English classic songs. 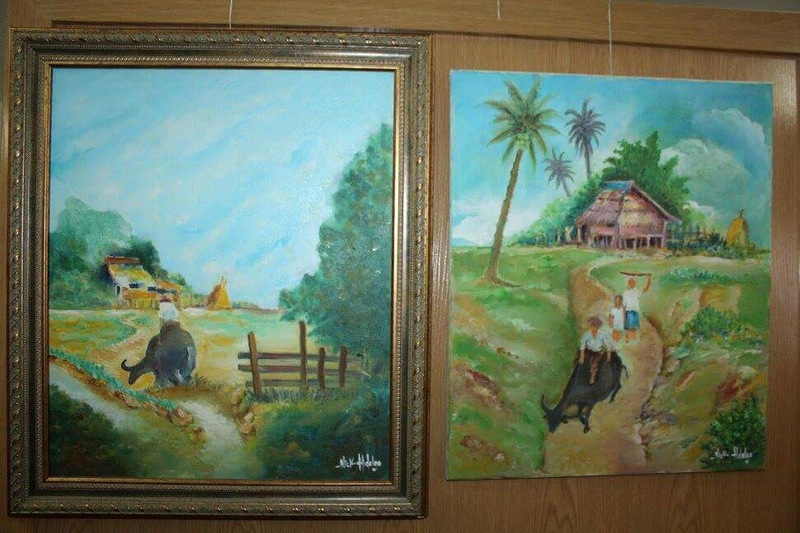 The exhibit was organized by the Tahanan Filipino Chaplaincy in Madrid, in collaboration with the Philippine Embassy in Madrid, and the family and friends of Mr. Hidalgo. The ribbon-cutting was done by three of Mr. Hidalgo’s surviving siblings (Cecilia, Erlinda and Willy) who also gave their respective messages during the opening program. In his message, Fr. Remigio Domino, SVD (who serves as Chaplain and Head of the Tahanan) related to the audience how he came to know about Mr. Hidalgo’s hidden talent as an artist. He learned that, as far back as when he was still a boy, Mr. Hidalgo already loved drawing. However, his artistic talent took a back seat to his other passion (singing). In fact, he never took formal lessons in drawing and painting. But he occasionally painted over the years, mainly as a hobby. 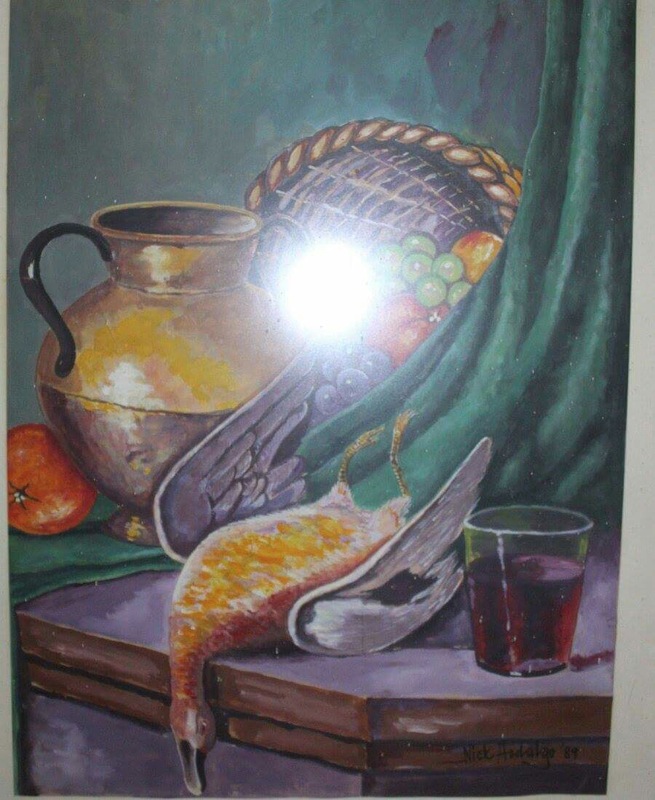 In spite of his lack of formal training in art, however, Mr. Hidalgo’s paintings have a professional quality that makes them deserving of a wider audience beyond his circle of friends. Fr. Domino, therefore, had no second thoughts when the idea of mounting an exhibit featuring Mr. Hidalgo’s paintings surfaced. For his part, Consul General Emmanuel R. Fernandez (who is currently the Embassy’s Charge d’Affaires) spoke of the important role that artists like Mr. Hidalgo play in the life of individuals and of society at large. “Artists,” he said, “help us see the beauty around us that we often fail to see; or that we sometimes see, but which we take for granted.” He then added that although the ability to draw or paint is a gift that is not given to everyone, all of us can at least adopt the mindset of artists and train ourselves to discover the beauty that lies hidden in the seemingly ordinary things we encounter in our daily lives. Mr. Nicanor Hidalgo was born in Lipa City on January 10, 1940 to HidalgMr. Paterno Hidalgo and the former Ms. Leonila Custodio. He studied philosophy at a seminary in Sariaya, Quezon; taught at the University Baguio before migrating to Spain; and, among other things, worked for several years as a marketing manager of Europhil Remittance Center.